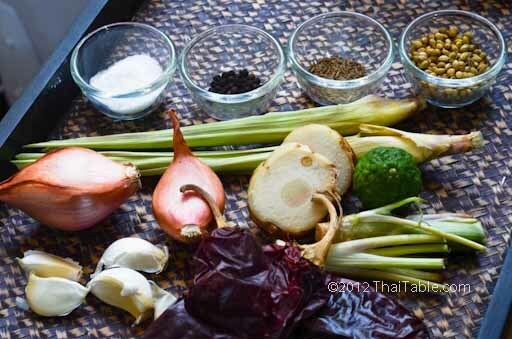 Most people don't know that red curry paste is not vegetarian friendly. 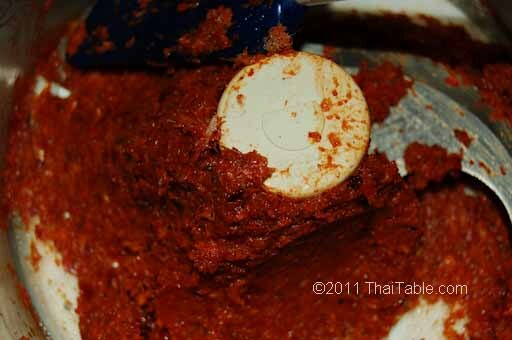 Shrimp paste is one of key ingredients in red curry paste. To have a real vegetarian curry, you must start with vegetarian curry paste. Unless you can find a home-made vegetarian curry paste, it's not available in stores. 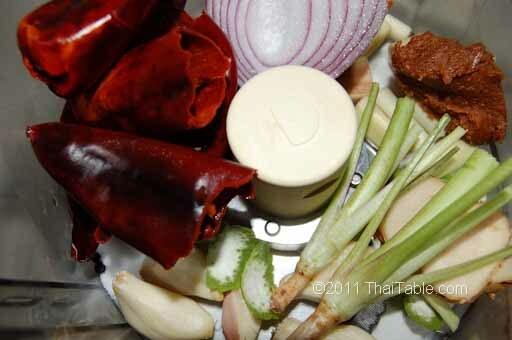 Even in Thailand, outside of vegetarian food festival, you will have to hunt for vegetarian curry paste. I made this recipe for my friend and her family. They love Thai food and Thai curries. Red onion is a great substitution for shallots. But do expect a wetter paste. Cilantro stem is a great substitution for root. One great thing about making your own curry paste is that you can control the heat in your paste. I use Anaheim pepper, or sometimes it's called California chili. The chili is quite large, 3-4 inches in length and not hot. I found them at Hispanic markets. You may want to use more dried chili peppers, or hotter chili peppers if you like hot food. I use large peppers that are not hot but give a vibrant orange color. Since the first edition of this recipe, I'm not sure if using food processor will save time. What you get from using mortar and pestle is that the incredible aroma from pounding the ingredients as opposed to cutting. I also have used miso originally. I have excluded the miso and didn't miss it. So, in this update, miso paste is eliminated. 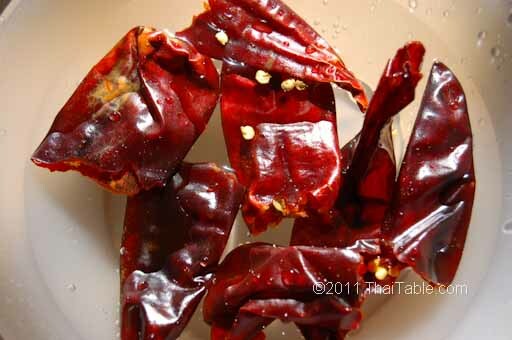 Soak the chili pepper in warm water for 10 minutes or until soft. You can see that the color gets brighter once when it's soft. Remove the stem and seeds from the peppers. 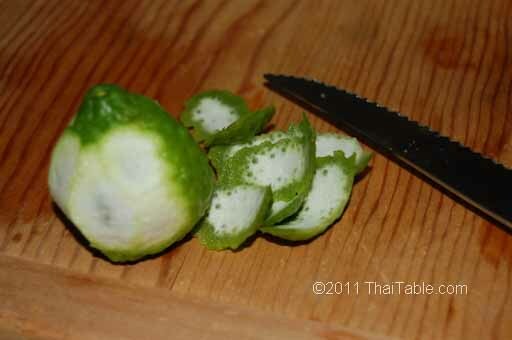 Skin the zest out from kaffir lime. Slice lemongrass thin to limit the fiber size. Peel garlic and shallots. Traditionally, all the ingredients would go into a mortar. But using food processor can be time and tear saving. Squeeze the water out from the chili peppers. Put the rest of the ingredients in the mortar, except for peppercorns, cumin and coriander. 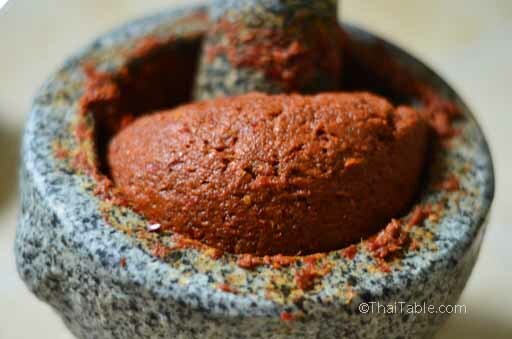 Grind the dry spices separately in a spice grinder or mortar and add them to the curry paste later. I found out the hard way that peppercorns do not get processed like other ingredients. They remain whole! Because curry paste will be mixed with other ingredient to make curries, you can be quite liberal with salt. But remember when you make curries, taste first before adding more salt. Salt in this recipe acts a preservative. Grind all the ingredients until well mixed and pasty in appearance. It should have a nice orange reddish color. The paste should be firm not watery. This curry paste will stay fresh for a few weeks in the refrigerator and for a year in the freezer.